Some other interesting numbers: Female 51% Male 49%. This is the first time I had more ladies than men on workshops. As Bill and I travel around the country doing some speaking and workshops, we’ve been asked a lot about the new GFX 50S, large format camera as well as what we hear that is coming from Fujifilm in the future. Frankly some things we can talk about but some things we have been asked to not comment on. Though I was able to test with the X-T2 before it’s release last year, I have not personally made any images with the large format camera, the GFX 50S. However, I finally got to see and hold the large format GFX 50S camera last weekend. I was really surprised on its size and weight Surprisingly it weighs about the same as a Canon 5D MK4 ! The images I look reviewed made with this camera were quite impressive to say the least. The jury is out whether I will want one or not yet but I am not in a rush. More on that later. What’s the main difference in the large format vs the X Series cameras from Fujifilm? From what I was able to see from the images made with the large format camera, the resolution, dynamic range, and color depth, are really great. This is solely as a result of a larger sensor. Depth of field is always improved with larger sensors, allowing for a much more smooth transition from in to out of focus area of an image. The images look somewhat more three-dimensional. Remember this is a mirrorless large format camera! Not having a mirror keeps the overall size of the camera smaller than the competition. Without a mirror you also eliminate those tiny vibrations which can show up as blur on your images – which by the way shows up a lot more at this high a resolution than with DSLR’s and existing mirrorless cameras. To me being mirrorless is really important. However equally important is the kind of shutter Fujifilm has employed in this camera. The GFX 50S will be the world’s first medium format camera to feature a focal plane shutter. What does this mean? 1) Lenses, can be built lighter than normal, and are designed for both the focal plane shutters well as the leaf-shutter lenses. Again, without having a shutter in the camera these lenses can be less heavy and smaller. 2) You can now attain faster shutter speeds than from typical cameras. 1/4000th is not unrealistic! The sensor in the GFS-50S is a Bayer Sensor made by Sony to Fuji Specifications. To say it’s a Sony sensor is only because Sony produced it. Fujifilm designed it using improvements that offer visible differences in the final images. The sensor offers a resolution of 51.4 million pixels! The lowest native ISO sensitivity is 100. Most impressive statistic to me is that the sensor offers a whopping 14 stops of dynamic range. Think about that! The GFX 50S has a touch screen and improved the screen maneuverability over the X-T2. On the GFX 50S you need to just press of a button rather to shift into the vertical position. There is a lot more to know about this camera. You local dealers should by now be about to tell you about it and perhaps even have one to show. Lots of information can be found on the FUJIFILM website as well. So far, the GFX 50S has been resounding success with lots of back orders and allocation headaches for Fujifilm. I guess that a good and bad problem! The question I bet some of you have is do I want one? I really don’t know. I’d love to shoot it for a few days….Do I need 51 MP? NO! Does anyone NO! However seeing the resolution and results of the dynamic range that this camera delivers vs the size and weight I might be tempted. How different it from the X-T2. Answer. Quite a lot. However there are things to take into consideration. Size, weight cost VS final results. Again, the jury is out. I am generally a landscape photographer that will make images of buildings, Americana as my good friend Bill Fortney calls it as well as macro photography. I suspect the studio folks, wedding shooters, specialty photographers (food, models etc.) will flock to this camera. Us landscape folks might be the last. Again the Jury is out for me. In my photography workshops I am see many DSLR’s and some mirrorless cameras with high-resolution sensors. The good news is how good the images CAN look if everything is done right. The bad news is that ANY (and I mean ANY) deficiencies ranging from poor technique to shaky tripods, to unacceptable lenses will show up on your images the more MP’s you have. I will go so far as to say that 75%+ of the Nikon D800 & D810 owners would be better off with D750’s or D500’s! You have to treat these cameras like fine-tuned cars. Any and all problems are going to show up, believe me. Camera Straps hitting the tripod, blowing in the wind causes vibration= blurry images…. Using a D800-810 .. its more visible! Also the RAW file out of the GFS 50S is about 110MB. That’s the RAW file! Make sure your computer isn’t going to crash if its too slow and have lots of hard drives—you’re going to need them! VERY IMPRESSIVE FUJIFILM!!!!! SO LET’S TALK ABOUT THE X SERIES! As far as the X-Series goes, the X-T2 as been a rousing success and is still in many cases back ordered. Those who have come and have come to know its capabilities have had nothing but praise for this camera. The FUJIFILM just released the new X100F. Later this year I am really excited that a new macro lens is on the way. It will be an 80 mm f/2.8 weather sealed with image stabilization. In 2018 a faster wide-angle zoom is predicted. I would hope it would be an upgrade and maybe wider than the current 10-24 mm f/4. (15-36 equivalent). Also a new long prime is forecast. Anyhow as always Fujifilm is listening to its customer base and I’ll bet there will be a few firmware tweaks on the X-PRO2 and X-T2. Product development folks at FUJIFILM are never content. They are constantly looking at ways to improve the X-Trans Sensor to totally compete and jump ahead of the DSLR marketplace. Latest numbers tell a sad story. 2010 marked the peak in numbers of cameras being sold overall. In 2015, the total sales were less than ONE-THIRD of the total photo camera sales of 2010. Here are some amazing numbers: In 2016 DSLRs sales were down 12% in volume but a whopping 29% in dollars. Mirrorless sales were up 22% in volume, and 49% in dollars. 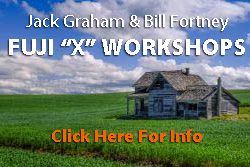 For about 2 years now Bill Fortney and Jack Graham have been conducting workshops together dedicated to ONLY users of the Fujifilm “X” System. These have been extremely successful. We have talked about taking the next step and making these workshops into a larger group event, with a different perspective on how the Fuji “System works for us and how it’s benefited our image making. BIG ANNOUNCEMENT FROM JACK & BILL COMING NEXT WEEK! On or before November 20th, we plan on having a BIG ( and we mean BIG) announcement about some great future events that are in the works. We will post the information HERE as soon as its finalized… we are almost there! To sum up our past 3 days here in Acadia National Park, Maine…all I can say is WOW! First the fall color—about the best I have seen in many, many years. Living in the western part of America, I sure do miss the reds that appear when the fall leaves turn color in the East. The weather has been great too…lots of rain, but at night, with great light during the day. More images with the X-T2/ FUJIFILM Event in Seattle this week! I just returned from a workshop on the southern Oregon Coast (Bandon South). Below are some images made during this event. I am still amazed at what the X-T2 is producing.